Cryptocurrency is a complicated mixture of several different fields, which contributes to the difficulty people have in understanding it. Even the term is confusing and often leaves novices scratching their heads. However, the multidisciplinary nature of digital currency is also probably one of its greatest strengths. Three different types of people are drawn to cryptocurrency: cryptographers/computer scientists, crypto-anarchists and finance professionals. Each of these types brings their own unique insights and perspectives. Bitcoin was invented and developed by the truly brilliant Satoshi Nakamoto. Although nobody knows Satoshi’s identity, we do know that the genius was exceptionally skilled in both cryptography and software development. Cryptography is a rather eclectic field, the forte of mathematicians and codebreakers. Satoshi possessed a strong knowledge of cryptography, and when he combined it with his understanding of computer science, he discovered the solution to a vexing problem. For years, some rather brilliant people had tried to devise a way to enable the transfer of value among a network of people who don’t trust one another. Such trustless transactions would have the potential to disintermediate the finance world completely. Satoshi’s solution was the Blockchain, which serves as a perfect, trustless, distributed ledger of all transactions done on the currency network he created: Bitcoin. Satoshi announced his development on the cryptography mailing list, an obscure forum frequented by some of the best cryptographers in the world. Hal Finney was one such person, and he worked with Satoshi very early in the Bitcoin’s history. In fact, the first Bitcoin transaction that ever took place was when Satoshi sent funds to Finney to verify that the software actually worked. Over time, more and more cryptographers and computer science gurus became associated with Bitcoin, and sometime in 2012, Satoshi vanished. Others carried the torch and continued developing the protocol. The computer scientists and cryptographers are the founders and maintainers of Bitcoin. The second wave of digital currency enthusiasts were the crypto-anarchists. They saw Bitcoin as a way to liberate the world from the grip of oppressive governments and their fiat-based financial systems. This group tended to be politically motivated and unwilling to compromise on their basic principles. Much of Bitcoin’s anti-establishment, decentralized culture comes from this group. Satoshi himself likely sympathized with their philosophy, based on posts he made to the mailing list and on BitcoinTalk. Because of their nature, this group abhors all attempts to regulate digital currency. To them, cryptocurrency isn’t about becoming rich or achieving mainstream adoption. It’s a social and political movement. The crypto-anarchists are the heart and soul of Bitcoin. They work hard to ensure the project remains decentralized and true to its founding principles. Somewhere around the end of 2013, the digital currency sector caught the notice of finance professionals. This group is generally less politically motivated and more willing to compromise on issues such as regulation and taxation. They seek mainstream acceptance and adoption of cryptocurrency. These finance specialists, many of whom have Wall Street credentials, have been highly successful in increasing the adoption of digital currency. With their help, Bitcoin has made significant inroads into the traditional financial system, and its value has boomed. Some, like the Winklevoss twins, have sought to establish options for mainstream investors to participate. Though their proposed exchange-traded fund (ETF) application was denied earlier this year, they have appealed the ruling. Recent changes in key SEC personnel could aid their cause. Likewise, Barry Silbert founded the Digital Currency Group which has full or partial ownership of a number of important Bitcoin-related companies. The Digital Currency Group owns Grayscale Investments, which sponsors the Bitcoin Investment Trust. This trust is publically traded under the GBTC ticker, and its value is backed by sizeable Bitcoin holdings. GBTC is one of the only ways that US investors can expose their tax-advantaged retirement accounts to the price of Bitcoin. Entire currencies, such as Dash, have been created when finance professionals discovered something that was missing in existing cryptocurrencies. Dash was founded by Evan Duffield, who himself holds a Series 65 license, and who realized that proper incentivization was missing from Bitcoin and other currencies. While the number of Bitcoin nodes has been declining over the last several years, the number of Dash nodes has been rising. A company called LedgerX will soon release a regulated market for the trading of Bitcoin futures, following the CFTC’s approval of their request this summer. This will allow traditional, mainstream investors to expose themselves to Bitcoin more readily, and will likely prove a crucial step in an ultimate ETF approval. The finance group is responsible for much of the Bitcoin’s mainstream acceptance to date. They have brought in institutional money and are continuing to build on-ramps for traditional investors to gain Bitcoin exposure. Bitcoin’s strength comes from the fact that so many disparate groups are interested in developing the project. At first glance, it might appear that the programmers and cryptographers are solely responsible for Bitcoin’s success, but this isn’t so. Crypto-anarchists, financiers and others have all played meaningful roles. Other talented individuals and groups will likely be attracted to digital currency in the future, and they likely have unforeseen roles to play as well. Looking at the various groups responsible for the development and continued support of Bitcoin makes me smile. Why? Because their motivations are strong and appear to be true. A good omen for the long term success and viability of Bitcoin. If you’d like to become involved in Bitcoin or mining same, click here and watch the videos. There are many mining operations but only a few are transparent, safe and honest. I believe I’m involved with two such mines: Genesis Mining and Galaxy Mines. Perform your due diligence and see if you don’t agree. With Genesis Mining, and Galaxy too, you can just be a customer. 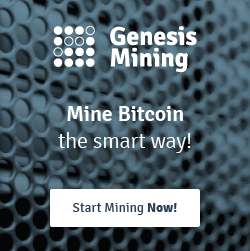 Or if you wish to invite friends, family or make it a network marketing opportunity that is also available with both companies but it’s not required– with Genesis Mining be sure and use the code listed above the tile ad to the right. Email with any questions: steve@prplus.us. Previous Post Are You A 3 Percenter? Next Post Is China Really Banning Bitcoin Exchanges, Or is it Fake News?